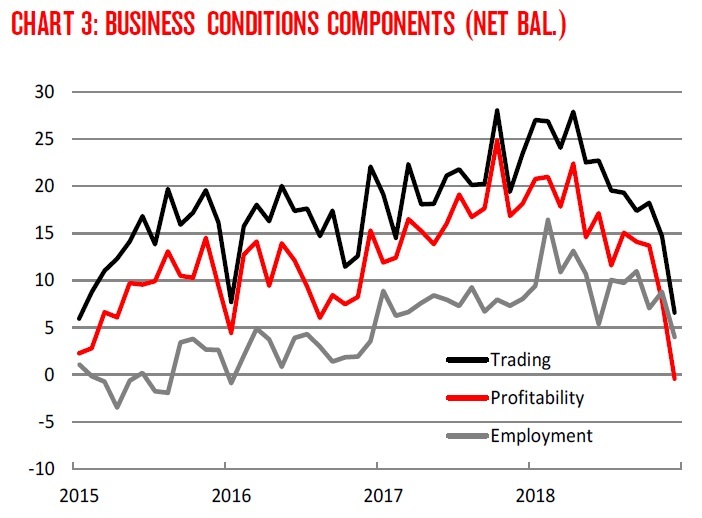 The RBA has started the year with a significant shift, lowering its growth outlook and acknowledging greater uncertainties and downside risks. While the Board still expects the economy to track towards its employment and inflation targets, and does not see a strong case for a near term change in the cash rate, there has been a clear change in emphasis. In particular, the Governor has moved from the view, expressed throughout 2018, that “the next move in the cash rate was more likely to be an increase than a decrease” to one in which the probabilities of the next move being up or down are “more evenly balanced”. This move to a balanced rate outlook is significant because it clearly establishes that the Bank is prepared to contemplate rate cuts – a position that has really only emerged since the housing markets have reversed. It is also consistent with changes announced by other central banks notably the US Federal Reserve. We see these changes as a welcome shift, bringing the RBA’s thinking more into line with our own. As expected, the Reserve Bank Board again left the cash rate unchanged at 1.5% at its February meeting. Also as expected, the Bank has lowered its forecasts for growth – outlined in the Governor’s decision statement and detailed more fully in his speech a day later. The RBA’s growth forecast for 2019 has been revised down from 3¼% to 3%, and its forecast for 2020 revised from 3% to 2.75%, the slowdown year to year reflecting a tapering in resource export volumes. It is significant that growth on average is still expected to be around the ‘trend’ rate of 2¾%. The RBA has also revised its inflation outlook with the forecast for underlying inflation for 2019 reduced from 2¼% to 2%, while the 2020 forecast remains at 2¼%. The Bank is maintaining the view that inflation will gradually move into the 2-3% band, although it is expected to take somewhat longer than previously expected. There are good reasons why the Bank lowered its growth forecasts. Firstly, while it still assesses the outlook for global growth as “reasonable”, it recognises that “downside risks have increased” (notably, when asked to rank the risks to the economic outlook, the Governor still nominates ‘global’ issues as a bigger concern). Secondly, it has made some significant changes around the household sector and housing. For some time, Westpac has argued that the fall in house prices in Sydney and Melbourne would be associated with a negative wealth effect weighing on consumer spending. In the RBA’s previous writings, it tended to dismiss this prospect. Although it is still downplayed, the Governor’s latest speech gives more weight to the issue, noting that rising housing prices provided an offset to slow income growth for some households and this effect is now shifting but that an expected pick-up in household disposable income was seen as providing a counterweight to the wealth effects of lower housing prices. Specifically, consumption growth is expected to hold at 2.75% in line with disposable income growth, implying a stabilisation in the savings rate. This ‘housing-consumer nexus’ is seen as a key area of uncertainty. It remains the key point of difference between Westpac’s 2.6%yr growth forecast for this year and next and the RBA’s at or above trend view. Westpac has also argued that residential housing construction would be a drag on growth in both 2019 and 2020. The RBA did not support that view, referring to a strong pipeline and only a gradual decline. Recent falls in dwelling approvals, across both high rise and non high rise segments, are now pointing more clearly to a significant drag on growth from the housing construction downturn. Accordingly the RBA has downgraded its view, the Governor indicating dwelling investment is forecast to decline by about 10% over the next two and a half years. The RBA continues to see rising business investment and higher levels of public infrastructure spending as the key growth drivers. It also remains positive about the labour market, reaffirming its forecasts for the unemployment rate to fall further to 4¾% by the end of 2020 and an associated lift in wages growth. The Reserve Bank’s revised view has narrowed the gap with our own but Westpac remains more downbeat. Even so, our weaker forecasts have not been weak enough to warrant forecasting a rate cut. Accordingly, even if the RBA moves further towards Westpac’s current view it seems likely that rates will remain on hold. The threshold for policy is whether spillovers knock the labour market off course. Our current forecasts do not incorporate that prospect but we acknowledge downside risks. As we add 160k workers per year while the labour market weakens, unemployment is going to rise. My guess is it will arrive at the ABS by Q2. Welcome to the rate cut club, Bill. Not Bill’s fault. He is desperate to release, but his masters have ordered him to keep edging. “wealth effect” being synonymous with “increased debt capacity due to debt inflation, being realised (by taking on more debt) and spent”. Wealth effect is just debt by another name. What we need is less debt, not more. And yes, for an economy with its foundations based on debt and not much else, that’s going to cause some issues. The fundamental issue is the economy is run by banks and bankers. To a bank, debt is awesome it is the way they make money and survive. If you’re not a bank however, debt is terrible and should be avoided at all costs. When our inspirational economic leaders are banks and bankers, of course they’re going to convince everyone an economy based on debt and nothing else is the best economy to have.